“The banks in their lending business are not only not limited by their own capital; they are not, at least not immediately, limited by any capital whatever; by concentrating in their hands almost all payments, they themselves create the money required, or, what is the same thing, they accelerate ad libitum the rapidity of the circulation of money. The sum borrowed to-day in order to buy commodities is placed by the seller of the goods on his account at the same bank or some other bank, and can be lent the very next day to some other person with the same effect. As the German author, Emil Struck, justly says in his well-known sketch of the English money market: in our days demand and supply of money have become about the same thing, the demand to a large extent creating its own supply.” (Wicksell 1907: 214–215). Wicksell, then, understood well the nature of endogenous money and how the financial and monetary system even of his day was endogenous to a significant degree, and the point that you can’t have an independent, exogenous money supply function that is truly independent if money can come into existence in response to the demand for it. In many ways, Wicksell’s work was an attempt to reconcile the classical quantity theory with the reality of endogenous money, but ultimately it was a failure. Garbade examines how the US Federal Reserve originally had the power to directly buy US government debt, and how this was done frequently from 1917 to 1935, in 1942 (during WWII) and some other years too. Bill Mitchell, “Direct Central Bank Purchases of Government Debt,” Billy Blog, October 2, 2014. Bill Mitchell also notes how Australia (before the 1980s) had a similar “tap” system in which the Australian central bank could directly purchase government bonds from the Treasury. This is all fascinating and lost history and, as Bill Mitchell notes, the idea that central banks should be forbidden from directly purchasing government debt is a piece of neoliberal fiction. There are clear lessons for today too. We have already seen how indirect central bank purchases of government debt on a large scale can limit government-debt-to-GDP ratios. It would be easier and more effective for central banks to do this directly, especially for nations like Japan where government-debt-to-GDP ratios are already very high. Garbade, Kenneth D. 2014. “Direct Purchases of U.S. Treasury Securities by Federal Reserve Banks,” Federal Reserve Bank of New York Staff Report No. 684, August. Robert Murphy and Tom Woods discuss Japan in the video below. This statement (admittedly poorly worded and probably confused) implies that Japanese real GDP has been contracting or falling for 25 years. That is pure nonsense. 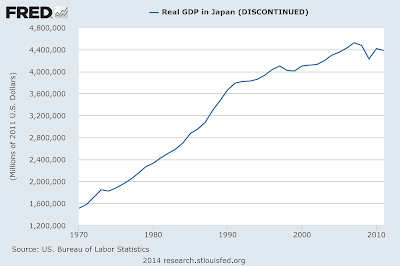 Look at the graph below of real Japanese GDP from 1970 to 2011. Despite its “lost decade,” real GDP continued a long-run rise even in the 1990s (despite a serious austerity-induced recession from 1997 to 1998), and has continued a longer long-run upwards trend for the last 24 years, although the global recession of 2008 to 2009 really hit Japan hard because of its reliance on export-led growth. But it is nonsense to say that Japan has been either “mired” in recession or experienced a long run contraction in GDP growth since 1991, or that Japanese GDP has been “sinking ever lower” in that time. Even the recent GDP figures for the second and third quarters of 2014 aren’t that bad, speaking comparatively: they show a mild recession, but nothing like the bad recession of 2008–2009. And it seems quite likely that the new recession in 2014 has been caused by Japanese contractionary fiscal policy in the form of an ill-advised sales tax increase, a policy of fiscal contraction similar to the equally disastrous austerity of 1997 (more on that below). Robert Murphy also makes this absurd error and asserts that Japan has “never recovered” from the collapse of its bubble and has been “mired in this rut” – presumably meaning suffering recession or stagnation – for over two decades. Murphy is just ignorant. Of course, nobody denies that Japan did have serious economic problems in the 1990s and early 2000s in what has been dubbed the “lost decade.” But it recovered from this “lost decade” around 2003–2006. Admittedly, there is also some dispute about when the lost decade ended. Some argue it ended around 2003, while others that it ended about 2006, when positive credit growth returned and deleveraging in Japan’s private sector ended (especially by corporations). That was clearly a sign of much healthier economy and long-run recovery, and it is clearly absurd to claim, as Austrian economists like Murphy do, that Japan has “never recovered” from its 1990s crisis. Of course, Japan also has special problems because it is highly reliant on export-led growth and has a falling population. But these are not directly related to the issue of the asset bubble collapse and crisis of the 1990s. If we wish to properly understand the “lost decade,” let us look at the history. (3) banking problems in which banks were saddled with bad assets and non-performing loans (a crisis that became acute from late 1997). But the “lost decade” of the 1990s was really an era of low growth, not continuous negative growth. Many myths have arisen about the lost decade, and one of them is that Keynesianism somehow “failed” to work in this era, as repeated by Murphy and Woods. That is nonsense. If anything, Keynesianism saved Japan from a terrible depression. In fact, when fiscal stimulus was abandoned for austerity in 1997, the economy plunged into a recession. Japan in the 1990s was somewhat like America in the 1930s. However, Japan differed from the US in that it averted an actual depression, though as in the US its fiscal policy was not applied properly and was then reversed in 1997 in a disastrous error. In the US, Roosevelt reversed his moderate fiscal expansion in 1937, and the US relapsed into depression in 1938. Both 1938 (in the US) and 1998 (in Japan) serve as warnings of the dangers of austerity in a weak economy. Above all, there was also flawed belief that monetary policy in the form of an experiment with quantitative easing would bring Japan out of deflation, when what was needed was increased fiscal policy. It is a pity that the lessons of the Japan’s lost decade is forgotten. On a purely practical note, what should Japan do? First, it should reject contractionary fiscal policy, including tax hikes. A first practical policy is that the Bank of Japan should engage in an aggressive bond-buying program to reduce its government-debt-to-GDP ratio. Further fiscal stimulus should be conducted in a way that stabilises and ideally reduces the government-debt-to-GDP ratio. Banking and financial regulation should be used to stop any further disastrous asset bubbles. Japan’s economy is heavily dependent on export-led growth, and so it should carefully manage its exchange rate to ensure demand for its exports is maintained. In the long-run, Japan needs to encourage more consumption and increase productivity growth. Finally, the 21st century will probably see a revolution as increasingly sophisticated machines such as computers with AI and robots are used in production. Japan is already a high-tech economy and will probably be at the forefront of this revolution. Japan is thus in a good position to increase its productivity growth and address the problems from its aging and falling population. All in all, Japan has reasons for optimism, despite its problems. “Japanese Real per capita GDP and Population Decline,” September 16, 2014. “James Galbraith on the Causes of Japan’s Lost Decade,” April 22, 2013. “Richard Koo on Europe, the US, and Japan,” February 8, 2012. “Richard Koo on the Current State of the Japanese Economy,” September 3, 2011. “Richard Koo on the Lessons from Japan’s Lost Decade,” July 4, 2011. Bill Mitchell, “Japan thinks it is Greece but cannot remember 1997,” Billy Blog, August 13, 2012. 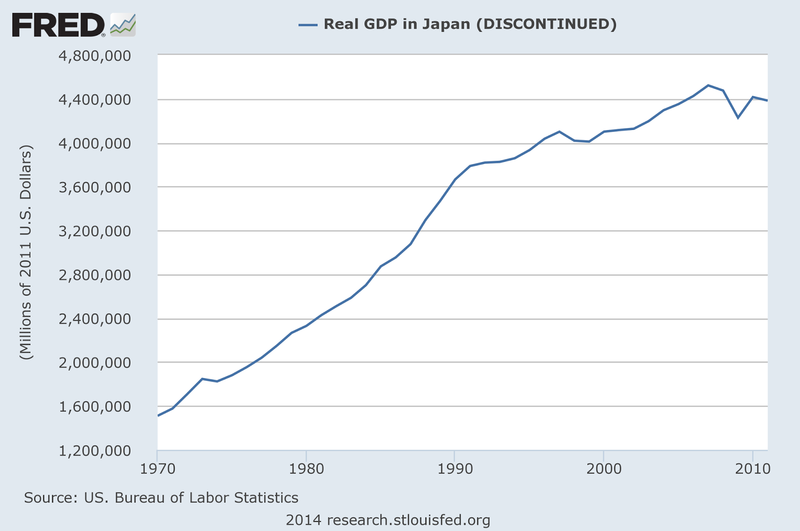 Bill Mitchell, “Japan returns to 1997 – Idiocy rules!,” Billy Blog, November 18, 2014. Bill Mitchell, “Japan demonstrates the Real Limits on Government Spending,” Billy Blog, November 4, 2014. Bill Mitchell, “Japan’s growth slows under tax hikes but the OECD want more,” Billy Blog, September 16, 2014. Izabella Kaminska, “Private Money vs Totally-Public Money, plus Some History,” FT Alphaville, November 21, 2014. There is also a link to my post on myth of the Scottish free banking era, and the way in which that system become oligopolistic and was dependent on the Bank of England. “Wage rates are market phenomena, just as interest rates and commodity prices are. Wage rates are determined by the productivity of labor. At the wage rates toward which the market is tending, all those seeking work find employment and all entrepreneurs find the workers they are seeking. However, the interrelated phenomena of the market from which the ‘static’ or ‘natural’ wage rates evolve are always undergoing changes that generate shifts in wage rates among the various occupational groups. There is also always a definite time lag before those seeking work and those offering work have found one another. As a result, there are always sure to be a certain number of unemployed. Just as there are always houses standing empty and persons looking for housing on the unhampered market, just as there are always unsold wares in markets and persons eager to purchase wares they have not yet found, so there are always persons who are looking for work. However, on the unhampered market, this unemployment cannot attain vast proportions. Those capable of work will not be looking for work over a considerable period—many months or even years—without finding it.” (Mises 2006 : 164–165). This view is hardly unique to Austrian economics of course; many streams of neoclassical theory think labour demand is wholly or mainly a function of the wage rate (and this is why they are obsessed with labour market deregulation and wage flexibility). The trouble is: it is not true. That is to say, the main cause of demand for labour is aggregate demand for output, and wages rates are very much a secondary phenomenon. Of course, nobody denies that if wage rates get too high, it will probably reduce demand for labour, or that in some markets wage rates might be the determining factor. But in most markets wages are relatively inflexible downwards, and a high degree of wage stickiness is a persistent and omnipresent characteristic of modern advanced economies. The empirical evidence that has accumulated over the years shows that people in general object to having their nominal wages cut, and workers are not generally, nor do they tend to be, paid their marginal labour product. In fact, very often workers simply do not know what their marginal product even is, and managers/employers find it difficult to calculate it (Bewley 1999: 82, 407). In many cases, such as when output is produced by a large number of workers with different roles, it is probably not even possible to calculate the marginal labour product of an individual worker. But it is worse than this, because there is a great deal of evidence that even managers and capitalists often dislike pay cuts. Recent studies suggest that employers avoid pay cuts because they diminish workers’ morale, and then falling morale reduces productivity, amongst many other reasons (Bewley 1999; see a nice summary of Bewley’s work on wages here). There is even evidence that by the late 19th century downwards nominal wage rigidity was already a serious fact of life in the American manufacturing sector (Hanes 1993). This type of significant wage stickiness has clearly been around for a long time, and certainly it existed in the golden age of capitalism (1946–1973), yet in that period unemployment was historically low and it was not due to wage rates adjusting rapidly to allegedly clear labour markets. Even when demand shocks are severe enough to cause wage and price deflation (as in the early 1930s), in an environment of high private debt, this would cause a severe debt deflationary crisis in a capitalist economy. Mises’ “unhampered market” is a fantasy world of little relevance to an empirical economics, and the central element in it – that wage rates would be the primary determinant of demand for labour and would be flexible enough to ensure that involuntary unemployment never reaches significant levels – is hardly credible as a condition that we would see in the real world. “Post Keynesian Labour Market Theory: A Summary,” August 21, 2014. “Two Summaries of Bewley’s Why Don’t Wages Fall During a Recession?,” June 17, 2014. “James Galbraith on the Essence of Keynes’ View of Labour Demand,” May 2, 2014. “Keynes on Nominal Wage Flexibility,” June 7, 2014. Mises, Ludwig von. 2006 . “The Causes of the Economic Crisis,” in Percy L. Greaves (ed.). The Causes of the Economic Crisis, and Other Essays Before and After the Great Depression. Ludwig von Mises Institute, Auburn, Ala. In what follows I give a brief overview of Alfred Marshall’s development of the quantity theory in the late 1800s on the basis of the discussion in Laidler (1991). In Classical Political Economy, the long-run value of gold money was thought to be determined by the cost of production of gold (Laidler 1991: 51). It was only in the short-run that the quantity theory was used to explain the value of money and hence the price level (Laidler 1991: 51). Curiously, the quantity theory of money was deployed by bimetallists and opponents of the gold standard in the 1873 to 1896 period (Laidler 1991: 50). This use of the quantity theory by bimetallists actually caused the quantity theory to be brought into some disrepute in this period, and advocates of the gold standard and sound money started to look on it with some suspicion (Laidler 1991: 52). Alfred Marshall actually sketched an early version of the Cambridge Cash Balance Equation in an unpublished paper of 1871 called “Money” (Marshall 1975 ), and later in his paper “Remedies for Fluctuations in General Prices” (Marshall 1887), and in his testimony before the British “Royal Commission on the Value of Gold and Silver” (1888–1889) and the Indian Currency Committee (1899) (Laidler 1991: 53). Hence before the early 20th century Marshall’s teachings on the quantity theory were mainly oral (Laidler 1991: 53). Marshall did, however, publish his views late in life in his book Money, Credit and Commerce (1923). Marshall, Alfred. 1975 . “Money,” in J. K. Whitaker (ed. ), The Early Economic Writings of Alfred Marshall, 1867–1890. Macmillan for the Royal Economic Society, London. Marshall, A. 1887. “Remedies for Fluctuations in General Prices,” Contemporary Review 51: 357–375. Keynes, J. M. 1911. Review of The Purchasing Power of Money: Its Determination and Relation to Credit, Interest, and Crisis by Irving Fisher, Economic Journal 21.83: 393–398. Pigou, Arthur Cecil. 1912. Wealth and Welfare. Macmillan, London. Marshall’s 1871 paper “Money” was a basic statement of his teaching right down to 1906 (Laidler 1991: 56). Marshall inherited the quantity theory from Classical economics, and in particular from John Stuart Mill’s writings (Laidler 1991: 54). But Marshall introduced the stock demand for money into consideration as a determinant of money’s value, and downgraded the importance of commodity money’s cost of production as a factor determining its value (Laidler 1991: 54–55). In explaining the price level, a greater emphasis was put on variations in the demand for currency by the Marshallians (Laidler 1991: 56). Alfred Marshall’s testimony, Minutes of Evidence taken before the Royal Commission on Gold and Silver. Forty-third Day, 19th December 1887 in Final Report of the Royal Commission Appointed to Inquire into the Recent Changes in the Relative Values of the Precious Metals; With Minutes of Evidence and Appendixes. Eyre and Spottiswoode, London, 1888. p. 2. Laidler notes that Marshall and the Cambridge Marshallians eventually de-emphasised and abandoned the velocity of circulation concept as an important concept in the quantity theory (Laidler 1991: 59). Instead, the important concept was the money people choose to hold as a stock (Laidler 1991: 59), or the cash balance which would become the variable k in the Cambridge Cash Balance Equation. Laidler, David E. W. 1991. The Golden Age of the Quantity Theory: The Development of Neoclassical Monetary Economics 1870–1914. Harvester Wheatsheaf, New York and London. Pigou, Arthur Cecil. 1917. “The Value of Money,” The Quarterly Journal of Economics 32.1: 38–65. “We must now shift our point of view a little; instead of starting, as in the former chapters, with a determinate series supposed to be given to us, let us assume that the individual only is given, and that the work is imposed upon us of finding out the appropriate series. How are we to set about the task? In the former case our data were of this kind:—Eight out of ten men, aged fifty, will live eleven years more, and we ascertained in what sense, and with what certainty, we could infer that, say, John Smith, aged fifty, would live to sixty-one. § 12. Let us then suppose, instead, that John Smith presents himself, how should we in this case set about obtaining a series for him? In other words, how should we collect the appropriate statistics? It should be borne in mind that when we are attempting to make real inferences about things as yet unknown, it is in this form that the problem will practically present itself. At first sight the answer to this question may seem to be obtained by a very simple process, viz. by counting how many men of the age of John Smith, respectively do and do not live for eleven years. In reality however the process is far from being so simple as it appears. For it must be remembered that each individual thing has not one distinct and appropriate series, to which, and to which alone, it properly belongs. We may indeed be practically in the habit of considering it under such a single aspect, and it may therefore seem to us more familiar when it occupies a place in one series rather than in another; but such a practice is merely customary on our part, not obligatory. It is obvious that every individual thing or event has an indefinite number of properties or attributes observable in it, and might therefore be considered as belonging to an indefinite number of different classes of things. By belonging to any one class it of course becomes at the same time a member of all the higher classes, the genera, of which that class was a species. But, moreover, by virtue of each accidental attribute which it possesses, it becomes a member of a class intersecting, so to say, some of the other classes. John Smith is a consumptive man say, and a native of a northern climate. Being a man he is of course included in the class of vertebrates, also in that of animals, as well as in any higher such classes that there may be. The property of being consumptive refers him to another class, narrower than any of the above; whilst that of being born in a northern climate refers him to a new and distinct class, not conterminous with any of the rest, for there are things born in the north which are not men. When therefore John Smith presents himself to our notice without, so to say, any particular label attached to him informing us under which of his various aspects he is to be viewed, the process of thus referring him to a class becomes to a great extent arbitrary. If he had been indicated to us by a general name, that, of course, would have been some clue; for the name having a determinate connotation would specify at any rate a fixed group of attributes within which our selection was to be confined. But names and attributes being connected together, we are here supposed to be just as much in ignorance what name he is to be called by, as what group out of all his innumerable attributes is to be taken account of; for to tell us one of these things would be precisely the same in effect as to tell us the other. In saying that it is thus arbitrary under which class he is placed, we mean, of course, that there are no logical grounds of decision; the selection must be determined by some extraneous considerations. Mere inspection of the individual would simply show us that he could equally be referred to an indefinite number of classes, but would in itself give no inducement to prefer, for our special purpose, one of these classes to another. This variety of classes to which the individual may be referred owing to his possession of a multiplicity of attributes, has an important bearing on the process of inference which was indicated in the earlier sections of this chapter, and which we must now examine in more special reference to our particular subject.” (Venn 1876: 194–195). The problem is closely related to probability theory. What, for example, is the probability that some particular person John Smith will contract cancer in his lifetime? Is there a fixed, objective, numeric probability that we can give? Some would say: yes. Can’t we just look at the frequency of how many people get cancer of the whole national population of the country where John Smith lives? Let us imagine that John Smith lives in the UK. According to statistical data, a UK citizen will have at least a 1 in 3 chance of being diagnosed with one of the many forms of cancer during his or her lifetime. The crucial class is: the class of those people who are diagnosed with cancer of all the UK population. So is there a fixed, objective, numeric probability of at least 1 in 3 that John Smith will contract cancer during his lifetime? On closer inspection, however, this does not necessarily seem to be right. Some people have a much greater risk of developing cancer than other people, on the basis of genetics and environmental influences like their incidence of smoking, excessive alcohol consumption and exposure to carcinogenic substances. Immediately, we can identify further, narrower reference classes to which John Smith might belong and which would change the probability of his being diagnosed with cancer. (8) the class of non-smoking, male people who do not drink alcohol and who are not exposed to known carcinogenic substances in the workplace and who do regular exercise and who develop cancer in the UK (since John Smith does regular exercise). If we were to look at the class of people in class (8), then we can calculate a statistical probability. But the trouble is: this is not even an exhaustive list! Can we really obtain a fixed, objective, numeric probability if we keep adding narrower reference classes and finally get to a point where we stop? Even here there is a crucial problem: the uncertainty of the future. Whatever probability obtained may well be overturned in the future, so that it can hardly be said to be objectively fixed in the long run in the way that the probability of rolling 6 in a fair game of die is actually fixed at 1 in 6 and becomes closer to this probability in the long run. Say, some new, preventive drug is developed in 4 years which cuts one’s risk of developing cancer by 60%, and John takes the drug. Suddenly his probability of developing cancer has to be radically revised. Say, John has an undiagnosed genetic disorder that modern science cannot identify that makes it 100% certain that he will develop cancer. Here the statistical probability, even in the narrowest reference class, will be wrong and clearly not an objective, numeric probability, because we have missed a fundamental fact about John. We can quickly see the difficulties that the reference class problem gives rise to, and how it can render statistical probabilities problematic. Of course, I do not want to suggest that statistical probabilities are useless: clearly they are not, and they can be very useful. But we should be aware of the limitations of statistical probabilities too, and how some may just give us the illusion of objectivity. Venn, John. 1876. The Logic of Chance: An Essay on the Foundations and Province of the Theory of Probability, with Especial Reference to its Logical Bearings and its Application to Moral and Social Science (2nd rev. edn.). Macmillan, London. In an interesting interview below, James Galbraith speaks on the role of government, the way it can be captured by the private sector, but also how it can play a crucial role in regulation and supporting the private sector. Peter Coy, “John Maynard Keynes Is the Economist the World Needs Now,” Bloomberg Business Week, October 30, 2014. (1) on the US (and in other nations), the essential early “medicine” – Keynesian stimulus – did work, but more was needed, though this is brought out later in the article. (2) also, the US was using Keynesian macroeconomic management well before the Kennedy tax cut of 1964. With its talk of the zero “lower bound” and monetary policy as an effective way to control inflation too (when it is not), the analysis clearly has the feel of New Keynesian economic theory, rather than heterodox Keynesianism. [sc. Question:]“9651. The evidence that has been put by some witnesses before us has been intended to show that so far from any connexion being traceable between plentiful money and a low rate of discount and a plentiful supply of the precious metals, the evidence was just the other way? The “rate of discount” is Marshall’s expression for the money rate of interest. But, for Marshall, in the long-run the money rate of interest is determined by the “real” rate of interest, which is in turn determined by the demand and supply of real capital goods (Bridel 1987: 38): the “real” rate concept is analogous to Wicksell’s natural rate of interest. But of course, for Marshall, variations in supply of gold can cause short-run changes in the money rate of interest. (4) the influence of speculators on financial asset markets (Bridel 1987: 38). If the supply of gold increases, for example, then this will induce excessive demand for real capital goods and price inflation, according to Marshall (Bridel 1987: 41), and if there is an expectation of further prices rises there might be a cumulative process of inflation as further investment occurs (Bridel 1987: 41–42). This process is a short-run phenomenon. Eventually banks will raise money rates of interest and a new equilibrium will be reached as money rates rise to equal the long-run “real” rate (the functional equivalent of the natural rate) (Bridel 1987: 42). Bridel (1987: 43) argues that Marshall missed the idea of “forced saving” and the latter insights of Keynes in the Treatise on Money (1930), that a contraction of consumption induced by forced saving lowers the marginal productivity of capital and hence lowers the natural rate of interest. Nevertheless, Marshall’s interest theory is clearly a precursor to the loanable funds theory (Bridel 1987: 44). Bridel, Pascal. 1987. Cambridge Monetary Thought: The Development of Saving-Investment Analysis from Marshall to Keynes. Macmillan, Basingstoke.